What age group are the mini-cars for ? The ideal age category is children from 5-12 years of age. In addition each model of mini car has a secondary adult seat, so a parent or guardian can assist a child who doesn’t want full control of the car. How much area do I need for a mini-car operation ? There is no maximum length for a track. A minimum footprint for a simple oval track would be 5.5 metres total width x 10 metres total length. A track width of minimum 2.5 metres is ideal. However the new mini quad can be used on areas even more compact than this for example 5 m x 4 m total footprint is definitely viable. Are the cars specific for indoor or outdoor use ? No, the cars will perform equally well indoors or outdoors. How many cars do I need ? The size of the track will dictate how many cars it is practical or safe to operate however we suggest a minimum of 3 cars. How fast do the mini cars go, and how fast should I operate them ? The cars will run up to a potential maximum of 10 mph, however this is easily reduced by the use of the operator programmable control unit, we suggest that approximately 5 mph is a good starting point. How long will the batteries last on one charge ? Running at the advised speed of 5-6 mph the car will run constantly for approximately 6 hours. When considering that even on the busiest days the cars do not run constantly, having to stop for driver changeover etc, most facilities will easily achieve a full 8-10 hour operation day without the need for a battery change. This long battery life is mainly due to our exclusive use of a 24V system throughout the range. Are the cars coin/token operated ? The battery mini cars we produce have a proven electronic coin validator fitted, this can be optimized to use coinage or a dedicated token. Alternatively the vehicle can be operated by simple button activation. Are there any extra costs to the price of the car ? No, each car comes complete and ready to use with a battery pack, charger, factory fitted coin validator, auto stop system and attractive graphics for every car. The only additional cost is the shipping from our United Kingdom factory, and any purchase tax. Are the go-karts safe ? All our cars have been painstakingly designed to combine appeal with the highest safety standards. All cars are extensively tested for safety under the ADIPS scheme and comply and exceed all the standards required. How much area do I need to create a viable kart track ? In a similar way to the mini-car operations there is no perfect answer to this question. 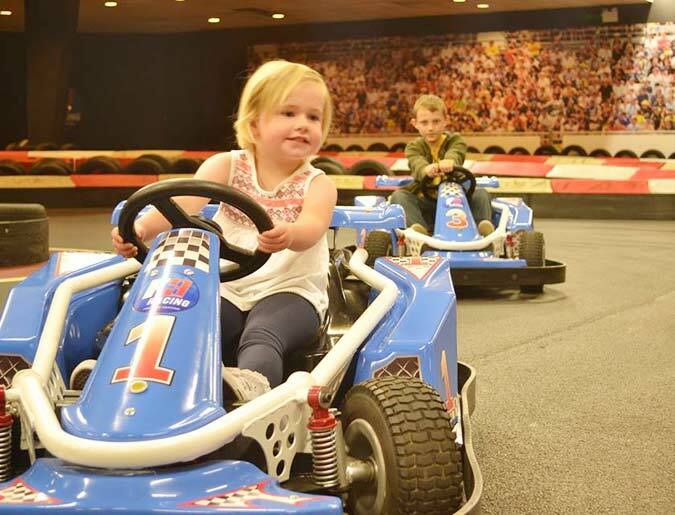 for a full size kart track it is advised that 5m of usable track width be retained around the track and that corners are kept to a 2M minimum inside radius. After this the only restricting factor is how many cars you may wish to operate if the track is small. With petrol engines it is normally considered practical to operate outdoors. However with electric power conversions you have a great solution for Indoor facilities. How fast do the go karts go, and how fast should I operate them ? For a public pay and ride operation a maximum speed should be set at approximately 18-20 mph. Which is a great compromise between driver appeal and safety. Can I just put some tyres down and create a track this way ? Technically we would say that this is possible, however there are many considerably better and safer ways to create a track barrier that will be less damaging to the equipment, safer for the driver, a lot more attractive and easier to operate. Give us a call to chat through the best options. What about a remote control system ? Is this really necessary ? For a low speed coin op mini-car track we would say it is helpful but not essential. However whilst it is listed as an option it is a must for any full size petrol or electric go kart operation. Handing control back to the operator during the higher risk periods of a ride cycle is essential for safety and protection of the rider and equipment. Are the cars really all made in the UK ? Absolutely all the Go-karts and mini cars are designed, manufactured and assembled here in our factory. There is obviously some bought in items for example the Honda Engines and mini car batteries however as much as is possible is produced here. We have CAD design, metal and plastics fabrication, and GRP (fibreglass) moulding premises all under one roof. Together with time served fabricators and assemblers we can keep quality high and consistent.